Irritable Bowel Syndrome (IBS) also known as spastic colon is a syndrome or a collection of symptoms rather than a disease in itself. 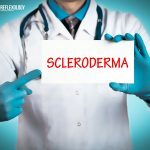 It is a functional disorder in which the digestive system does not function correctly leading to symptoms like abdominal pain, discomfort, cramping, gas, bloating constipation or diarrhoea. IBS affects the large intestine or the colon and may be caused due an infection or as a reaction to a traumatic life event. Although, there is no known cure for IBs, but its symptoms can be controlled and relieved through medicines and alternative therapy. 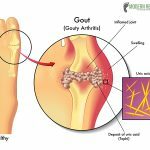 Acupressure is an effective alternative treatment for irritable bowel syndrome that promotes the body to regulate the malfunctions of the underlying organs. Foods – Allergy or intolerance to certain foods can act as a stimulus for IBS. 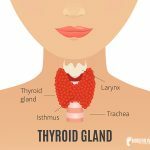 Some of the foods that trigger the symptoms are chocolate, spices, beans, milk and milk products, alcohol, cruciferous vegetables, etc. Stress – In many people the symptoms of Irritable Bowel Syndrome are triggered during periods of increased stress. Hormones – Hormonal changes and imbalances also play a role in IBS trigger and therefore it is more common among women. The signs and symptoms of IBS worsen during menstrual periods. Illnesses – Certain illnesses such as acute diarrhoea or bacterial overgrowth in the intestine can trigger IBS. 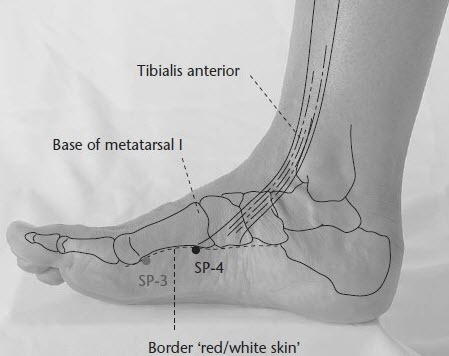 This is one of the potent reflexology pressure points used as a treatment for IBS and digestive disorders. 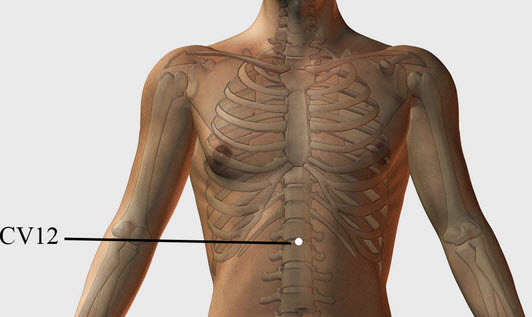 This acupressure point is located halfway between the lower end of the breastbone and the belly button. Stimulating this point using soft circular motion can help in treating lack of appetite, stomach upset, IBS symptoms and other digestive disorders like gas, bloating, the fullness of stomach and acid regurgitation. 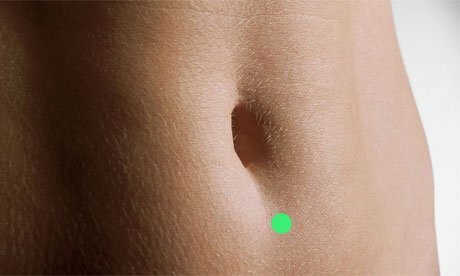 This is one of the most empowering acupressure points for the treatment for irritable bowel syndrome that is located two-thumb width away from the belly button on either side. 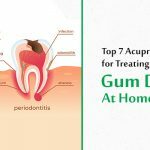 Putting pressure on these points using your fingers can help in treating all kinds of intestinal disorders such as Irritable Bowel Syndrome, constipation and diarrhoea. Activating this point helps in the movement of abdominal blood which can alleviate menstrual irregularities. 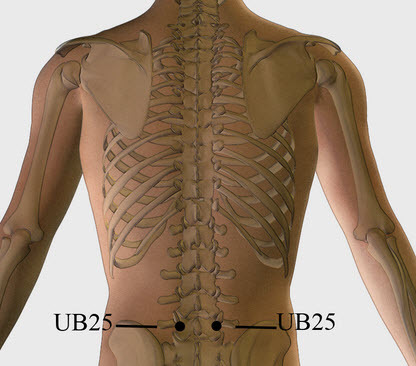 St36 or the Three Mile Point is one of the vital acupuncture points for irritable bowel syndrome that is situated four finger widths below on the edge of the knee cap and one thumb’s width to the outside of the shinbone. This point is helpful in strengthening the whole body and relieving problems of indigestion and IBS irritable bowel syndrome. 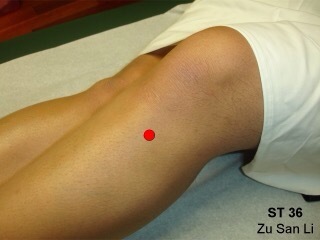 Putting pressure on this point also helps in treating joint pain and pain resulting from arthritis. Urinary Bladder 25 also known as the Large Intestine Shu is located at the back, 1.5 cun lateral to the lower edge of the 4th lumbar vertebra. This pressure point is especially useful for treating irritable bowel syndrome along with abdominal distension, constipation, haemorrhoids, diarrhoea, lumbar pain and Urticaria. It also helps in relieving lower back pain and strengthening the lower back. Stomach Meridian 37 or the Upper Great Hollow is a widely used point in acupuncture for irritable bowel syndrome treatment. 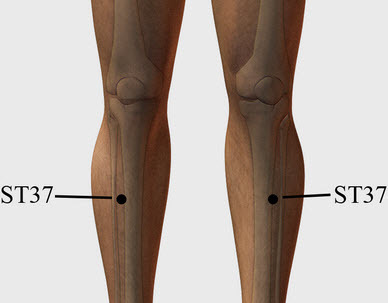 This point is located on the anterior aspect of the lower leg, four finger widths below the kneecap. 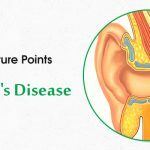 This pressure point is especially helpful in relieving acute appendicitis, abdominal pain, diarrhoea, dysentery, constipation, symptoms of IBS and paralysis due to a stroke. Large Intestine 14 or the Upper Arm is the potent point of acupuncture for IBS that is helpful in treating acid regurgitation, IBS symptoms, depression and hiccups. 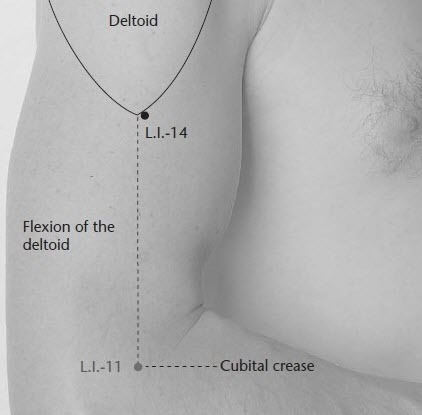 It is located on the radial side of the upper arm, four finger widths below the end of the shoulder blade, at the insertion of the deltoid muscle. It is a local pint for relieving shoulder pain, weakness in upper arms. It also helps in treating eye disorders like swelling, redness and pain. Now, get long lasting relief from the nagging symptoms of Irritable Bowel Syndrome such as abdominal pain, cramping, gas, bloating, constipation and diarrhoea in a natural way with these important acupressure points that can be considered the best alternative therapy for IBS treatment. One of d best method explaining points with images.i request if possible give points details on hand as known as sujok theory along with your present method.highly appreciated your hard work.tks.